We went to Cal Ranch the other day, and I found these little hats. I just couldn't resist! I didn't buy them, but I sure took pictures! So sweet, I just wish I would have taken her binky out! Oh well, still cute as a button! that's perdy cute! brecklyn won't use pacifiers..... just as somethin to bite on or play with once in a while! 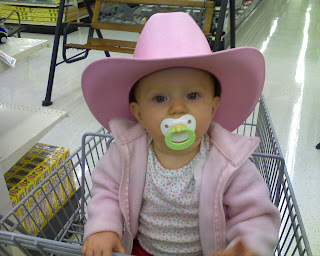 Go cowgirl! Where's the wrangler jeans?! Too cute for words. 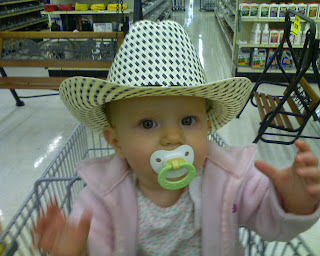 What a cute little cowgirl...just like her mom! I am so mad I never saw her before we moved and now she is almost 1! Wow, time flies!